Rosinweed is an erect perennial forb of the Upland Garden, growing up to 6 feet high, on sturdy stems that are cylindrical to slightly angled, green with stiff small hair when young, becoming somewhat smoother when older and sometimes reddish when in full sun. Some plants may lack stem hair entirely. There may be branching at the top. It is native to parts of the U.S. but not to Minnesota. Varieties: There are two - see notes at bottom of page. The leaves are opposite with very tiny teeth on the edge (or no teeth) and no leaf stalk, but leaves do not surround the stem. They are lanceolate (broadest in the lower half) to ovate with bases round to heart-shaped and pointed tips. Upper and lower leaves are similar in size and both surfaces have fine stiff hair giving a sandpaper texture to the touch. Basal leaves fall away before flowering. The floral array is an open branched cluster of flower heads at the top of the stem and side stems. Flowers: The flower heads are 2 - 3 inches wide, with 12 to 22 yellow ray florets that are female only and fertile. Each ray is 1/2 to 1 inch long with a branched style at the base. These surround the central disc, which is 1/2 to 1 inch wide and composed of a large number of male disc florets that have 5-lobed yellow corollas and 5 stamens with brownish anthers which surround a single style which is not fertile making the disc florets functionally staminate. The corolla lobes of the florets flare outward at the tips. The phyllaries (floral bracts) of the outer flower head are in 2 or 3 series, all with pointed spreading tips. These are either hairy or smooth depending on the species variety. In the Silphiums, each ray floret is subtended by a phyllary. When in flower, the plant has a resinous aroma. Seed: Fertilized ray flowers produce a dry oblong cypsela, 9–14 × 6–10 mm, without pappus, but slightly ridged for wind distribution. Silphium seeds require 60 days of cold stratification for germination. 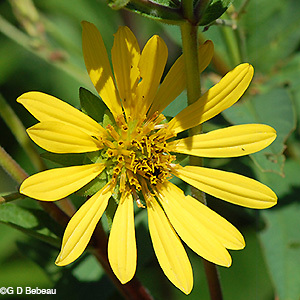 Habitat: Rosinweed grows from a fibrous root system containing small rhizomes that allow vegetative growth. It needs full sun, poor to loamy soils, and mesic to dry conditions. 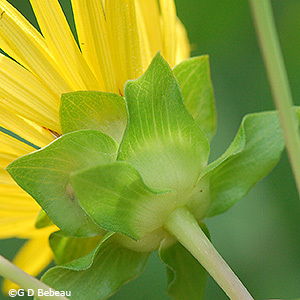 Names: "Rosinweed" is a common name applied to many Silphiums due to the resin in the plants. 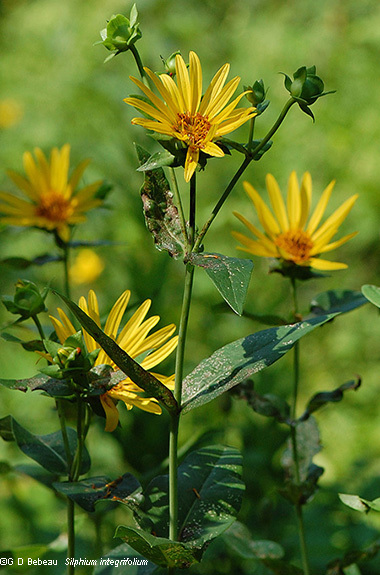 The genus name, Silphium, is from the Greek word silphion, which was a plant of North Africa said to have resinous juice that was medicinally sought after. This plant appeared on ancient Greek coins of the city of Cyrene. 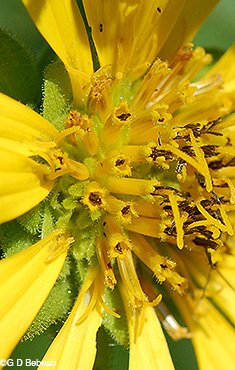 Silphium is used today for a group of plants with resinous juice. 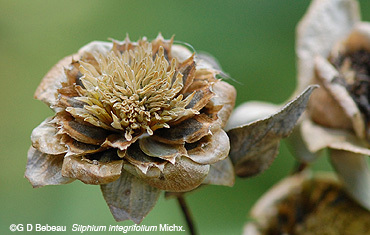 The species name integrifolium, is from the Latin for "entire or uncut leaves". The author name for the plant classification - ‘Michx.’ is for Andre Michaux (1746-1802), French botanist who made many exploring expeditions in the U.S. collecting and cataloging many species. Two important works were the Histoire des chênes de l'Amérique septentrionale (1801 - Oaks of North America), and the Flora Boreali-Americana (2 vols., 1803). His son Francois, traveled with him and the father’s notes were later used for the 3-volume North American Sylva, for which Thomas Nuttall provided some supplements. Comparisons: To separate this plant from other sunflower types, look for the rough opposite stalkless leaves, most with tiny teeth. Rosinweed is one of the four Silphiums in the Garden. Here is a comparison chart. Above: The floral array is an open branched cluster of flower heads. Drawing from Britton, N.L., and A. Brown. 1913. An illustrated flora of the northern United States, Canada and the British Possessions. 3 vols. Charles Scribner's Sons, New York. Below: The staminate flowers of the disc have tubular corollas with outward flared lips, while the pistillate flowers that surround the disc have a wide yellow ray, with the branched style at the base. 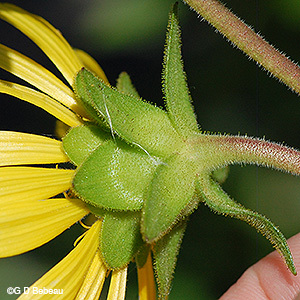 Below: The flower head has 3 series of phyllaries (floral bracts) where the outer series reflexes outward. These may be with or without fine hair. The variety integrifolium (1st photo) has phyllaries with rough or hairy outer surfaces, while the variety laeve (2nd photo) has smooth surfaces. Below: 1st photo - Seedhead late Sept. The seeds are the broad flat achenes surrounding the old central disc. 2nd photo - Stem leaves are opposite, ascending and sessile. 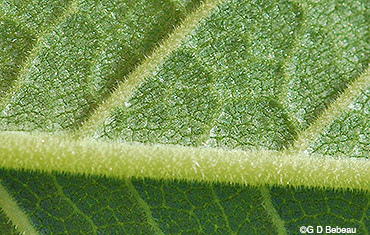 Below: Both the stem and leaves have stiff short hair creating a sandpaper texture. 2nd photo is the underside of the leaf. Below: A large cluster of Rosinweed on Aug. 4, 2009, at the path intersection at Station 36, within an area that had been recently rejuvenated. Notes: Eloise Butler introduced Rosinweed to the Garden on Oct. 9, 1926 with plants sourced from Royal Nebraska. That was the only time she planted it. Martha Crone reported Rosinweed in bloom on July 13, 1939 so the plants had survived. She planted it on Oct. 14, same year. She sowed seeds in 1944. However, it was NOT listed on her 1951 inventory of plants in the Garden at that time, so was missed or was added again sometime later. 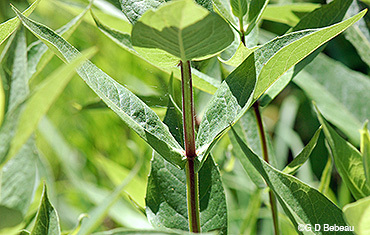 It is reported to be native to parts of Minnesota in certain older literature but the Minnesota DNR does not list the plant as native or to be found in MN. The University of MN Herbarium speculates that species may have been found in the state along the southern border as it is native to Iowa, but only to one county bordering Minnesota. 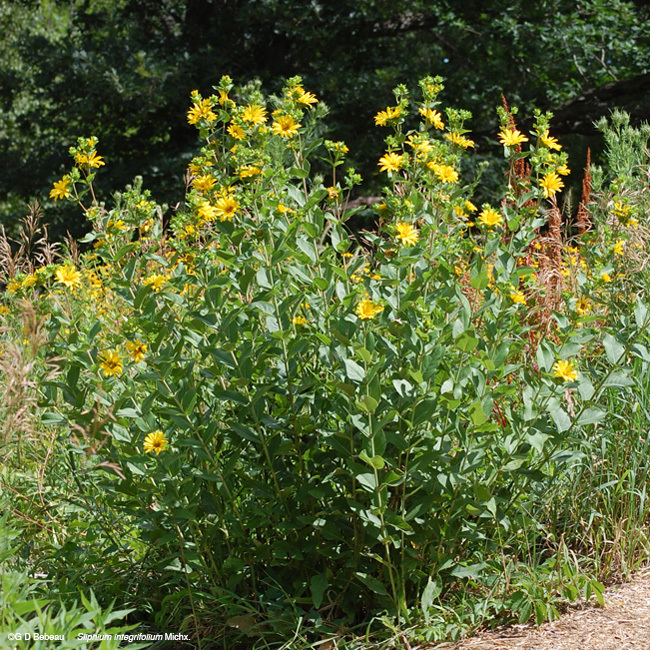 Chances are the plants noted in the wild in previous years in various places were planted. The Garden stock is certainly from nursery stock or seeds that Martha Crone sowed in 1944 when she began developing the new Upland Garden. The species is native to much of the Central United States. 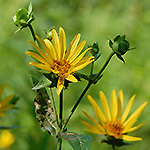 Only two Silphiums are native to Minnesota: Compass Plant, Silphium laciniatum var. 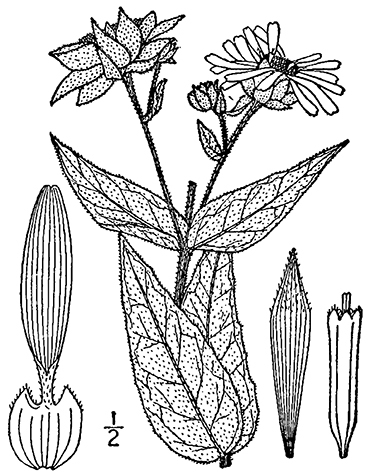 laciniatum and Cup Plant, S. perfoliatum. Varieties: There are two varieties of the plant: var. integrifolium, which the U of M considers to be the species that is nearest to Minnesota, has phyllaries with rough or hairy outer surfaces and 12 to 22 ray flowers; var. laeve has smooth phyllaries and 20 to 36+ ray flowers. 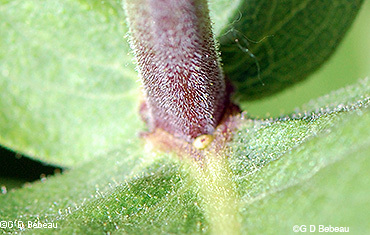 Hair on the stem is more related to individual plants rather than the variety. For more detail on this plant and the other Silphiums, see the article "The Four Silphiums".